We have come a long way with modern plumbing that we hardly even notice that we have drains and sewer. Unless the bath spigot turns a bloody red or the toilet overflows, exorcists, and plumbers will usually be the last things on our minds. Nowadays we just push a button or lever and get rid of waste without ever having to see it or even think of it once it goes down the drain. 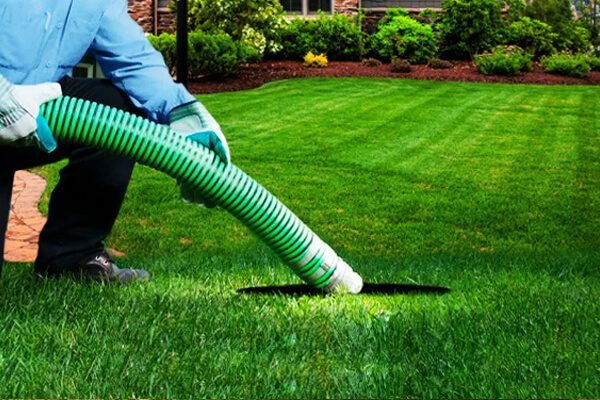 This article pulls you back from the fancy clean household spaces and to the backyard, where the green patch of grass leads to the covering of the septic system. According to the American Ground Water Trust, up to a third of American households have a septic treatment system in their homes. These systems are made to be simple in that most of the effluent from the property leads to one pipe that empties into a septic tank in the yard. The system combines the waste water from the washing machine, sinks, shower, and toilet, all of which drain into the septic tank. In the tank, the mixture of solid and liquid waste starts to decompose. The heaviest material known as sludge typically sinks to the bottom of the tank, while the proteins, oils, and fats known as scum float on top of a middle layer made mostly of grey water known as effluent. The combination of all these layers is called septage. Most septic systems are made to discharge the effluent from the system onto drain fields and leave the scum and sludge behind. This is achieved through a set of pipes in the tank that takes the effluent and releases it below ground where it is absorbed into the ground. Given how much organic material is in the effluent, the yard where it is discharged is typically the most fertile portion of yard on the property. Septic systems may be some of the simplest installations on your property but you still need to monitor them if you do not want a mess on your hands. 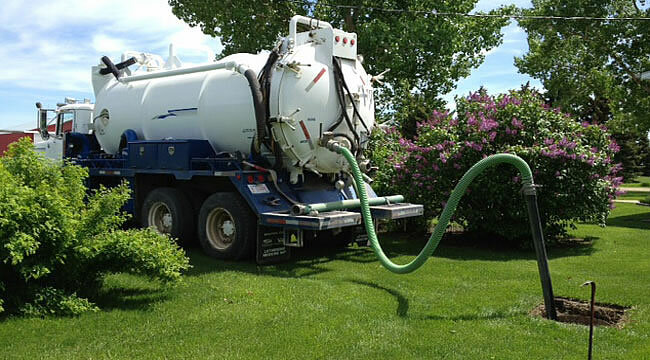 The thing with septic systems is that once the problem becomes big enough to notice, it will be time to bring in the big guns as simple solutions just will not do. Unfortunately simple as they are, fixing big problems with your septic systems could require labor and labor that could run a bill into thousands of dollars. As such, it is critical to perform regular maintenance on the system, so that you can notice slam problems before they morph into big expensive ones. Is it a Good Idea to Pump Your Septic Tank? Even if you have a healthy septic tank system where the microbial system is working as it should breaking down the septage, and disposing of the effluent on a good drain field, over time the tank will have a buildup of scum and sludge. That is why it is so critical to perform regular pumping of your tank. It always works best to pump your tank when the scum has risen to about 6 inches from the outlet pipe or when the sludge layer is about 12 inches from the scum. You need to be extra vigilant to know when your septage reaches these milestones so that you can act at the appropriate time. The most appropriate period for checking the levels in the septic tank that has been found to work really well is about a year. The typical inspection will involve measuring the levels of the scum and sludge, checking to ensure that the mechanisms and pipes are working as they should and that the drain field is filtering the effluent efficiently. According to the EPA, An average sized septic tank system has to be pumped at intervals of between one to three years. Some septic tank owners that do not want to pump the tank so regularly, have resorted to buying products that claim to break down the sludge. However, the claims of most the manufacturers of such products often turn out to be wildly exaggerated. For one, the additives do nothing to enhance the microbial reactions in your tank, and will at the worst mess with the natural ecosystem in the tank making it more difficult to break down waste. The EPA recommends that homeowners need to only do the traditional pumping and inspections and their tanks should be fine. If you do not want your system to overflow, you need to set up a regular pumping schedule. Sometimes the overflow can back up into the house when the drain and toilets spew back what should be going into the septic tank. Overflow can also be bad for the drain field, which could be flooded with a sudden cascade of untreated waste. The overflow can cause havoc underground, where it can drain into underground water, while above ground it can run off into rivers and creeks or flood your yard. This could be very dangerous to human health, as unprocessed waste could contaminate drinking water with nasty bacteria and harmful diseases such as hepatitis. 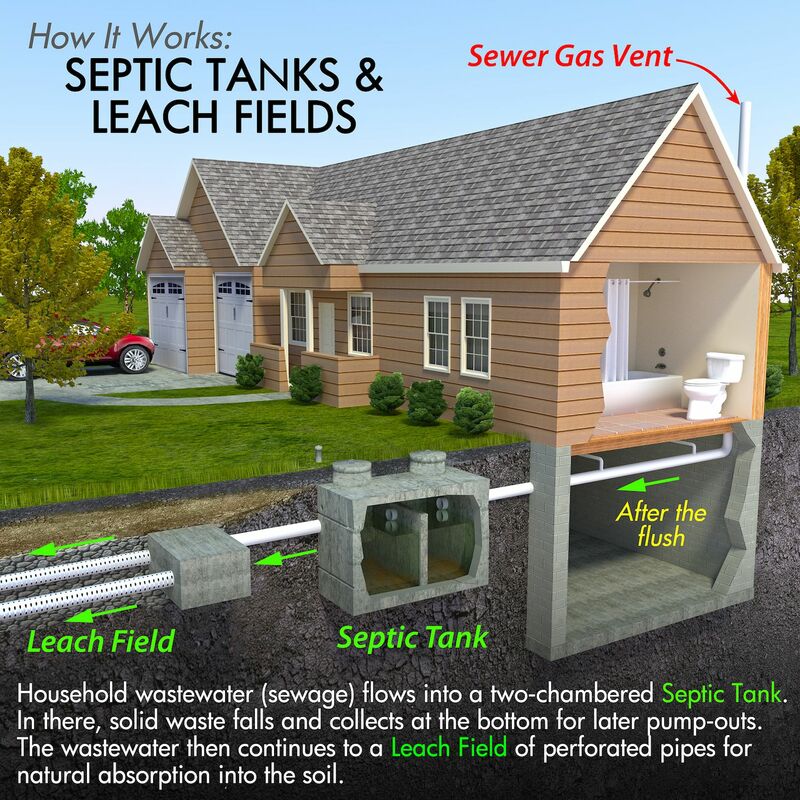 Any neighborhood or city with a lot of homes having onsite septic tank systems typically attracts local businesses that specialize in the removal of sludge and sum from those tanks. These services serve a critical role in preventing overflow from sludge buildup, which can be bad for not only the homeowner but others in the vicinity too. Septic tank pumping will typically involve a thorough cleaning of the tank to remove all the scum, sludge, and effluent. Not so long ago, waste companies used to dump the waste they had picked up from onsite septic tanks in dumpsites. Thankfully the practice has now been outlawed given that it is a huge health hazard. State and federal laws now govern what happens to household waste when it is removed from your septic tank. In some instances, the septage is combined with the waste from municipal sewer systems, taken to waste treatment plants, or transported to businesses that treat sewage. At the processing centers, the septage is treated with biological and chemical processes, which break it down into less harmful effluent. There are a few cases of septage being dumped in a landfill but under strict guidelines. Given how complicated the disposal of septage can be, septage has found other uses including growing food. According to the USDA, if you have ever had any food that did not have the USDA Organic label, it is very probable that the food may have been grown using sludge as a fertilizer. The use of septage as a fertilizer can stir up a lot of controversy. Those for it, which include most of the farmers benefiting, assert that everyone wins with the solution as farmers get fertilizer on the cheap, while municipalities do not have to deal with finding ways to safely get rid of the waste. Proponents argue that the septage as fertilizer should cause no hazard if it is applied to farmland in the appropriate way. Just like a drain field filters effluent, farmland should filter the sludge and leave water sources uncontaminated. The latest use of septage is even edgier as it has been tapped to make electricity that can power homes. The Methane that is produced from the breakdown of sewage material can be tapped to make electricity. Methane can be used to power fuel cells at treatment plants, which can then be used to make electricity. What is even better is that this method of generation does not produce any pollution yet it packs quite a punch. A CNBC article reported that one such system made enough power that could be used by up to 1000 homes. I bet you never knew how much power lay in your septic tank.